If you know kids, you know they sometimes leave behind a trail of debris. Kid detritus comes in many fun forms at my house – popsicle stick sculptures, broken bracelets they made at school, 100+ drawings of the family, valentines cards from 3 years ago, Dollar Store party favors, outgrown clothes they can’t quite part with, and more. Right now our home is just about bursting at the seams with these things. Fortunately for me (and the planet), kids are also amazing at getting inspired and enthusiastic about worthy causes. With a little effort, it’s totally possible to get kids excited about zero waste. And the more we get kids on board, the brighter our future gets. Here are my top 10 ways to help kids reduce their waste and go for zero. Zero waste kids, here we come! Inspire them! Share success stories from zero waste heroes. Those year’s-waste-in-a-jar pictures can be really inspiring to kids. I love Bea Johnson’s zerowastehome.com. Get them involved in your grocery shopping! Showing them how to shop in bulk and what’s available in your store helps them wrap their heads around what you’re doing at home. I let them pick a couple of snacks from bulk bins. Bonus: These snacks go into jars in the cupboards, so we can all easily see what’s available and how much. They also love helping me take pictures of our groceries – all that arranging and color sorting. Fun times for their busy brains. One week’s groceries, in rainbow order :). Give them the tools – their own napkin, utensils, water bottle, jar, containers, lunch box, etc. If kids feel ownership and responsibility over their own tools, they’re more likely to enjoy and use them. No Trace has lots of options here. Role model! Actions speak louder than words. When kids see you carrying your own water bottle and napkin, that’ll inspire the same from them! Find zero waste alternatives for their favorite foods. Can you find a package-free alternative to one or two of their favorites? Homemade everything is really hard – but maybe there is one really special swap you could do for your kiddos. Homemade crackers or granola bars, maybe? Homemade chocolate chip cookies? Bonus: it’s a great way to get them helping in the kitchen – if they help you, you’ll make it! Anticipate the challenging moments, and prepare them! Birthday parties, Halloween, air travel, dentist and doctor’s doctor’s offices, free samples at the grocery store. Are they allowed to bring anything home? Are there limits or restrictions? Talk about it so they know what to expect BEFORE you’re in the moment. We were going through a phase of being invited with friends to frozen yogurt after school every week. I finally got my act together and brought jars and spoons to avoid the waste and say YES to the invite. Happy about some frozen yogurt and fresh fruit! No guilt, only encouragement! It is really hard to avoid waste in today’s society. They may not have any buddies whose families are going for zero. Make sure they know that what’s most important is doing their best. We’re trying to tread lightly on the planet so we can share it with others for generations to come. Educate them! 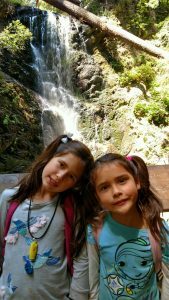 Take them to the landfill or the recycling plant (Santa Cruz recycling does a great tour – and it’s kid friendly), show them kid friendly videos on landfills and plastic pollution. There are some great things on youtube like this one on landfills and this one on plastic bottles! Encourage them to think about how much stuff (i.e., toys and clothes) they need, and whether they could share some things with others. Sometimes helping them cut down on how much they own can help them cut down on how much they want to consume. Is there a shelter nearby where you can donate some excess? Or a thrift store with a cause you can all get behind? In Aptos has Caroline’s thrift store, which donates it proceeds to worthy non-profits in the community. If kids know where some of their things are going, it makes it easier to say goodbye to stuff. Try to make things together, instead of buy. I know, who has the time for that? I had to make a promise to myself and my kiddos on this one – I gave them each a gift this past Christmas of a coupon for making something together. Evenings and weekends are full of dance, soccer, birthday parties, dinner, homework, and reading. There isn’t always a ton of spare time for extra projects on top of that. 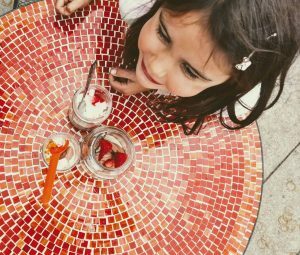 But, if there are a couple of special items your kiddo really wants, you can both squeeze in the time over the course of a few months. Especially if you’ve already committed yourself. Explain that every family has different ideas, values, goals, and projects. Not every family can aim for zero waste, and that’s okay. It’s important that they know that not all their friends will be able to or interested in cutting down their waste. And that’s okay. I remember that we still make waste as a family, and I go easy on us. We are doing a lot, but we aren’t perfect. I try to learn from what we throw away and think about new habits to help us reduce our waste on a regular basis. That feels like success in my home, and my kids are engaged and interested instead of overwhelmed. There you have it. My top 10 ways to inspire the zero waste kids in your life. Is zero waste a family value at your house? I’d love to hear about your family practices. What makes a business zero waste? In simple terms, zero waste is a goal of maximizing our planet’s resources by keeping resources in the life cycle and out of the landfill. The ideas behind the zero waste movement center around redesigning our lives and environments so that our resources remain in a cycle of creation, use, and recycling. What is a zero waste business? A zero waste business embraces this philosophy of maximizing and reusing resources throughout every stage of design, production, distribution, use, and recycling or reuse. In addition to considering the life cycle of all materials used in a business, zero waste philosophy means working with sustainable resources, such as recycled or all natural, biodegradable materials. No Trace is a zero waste business. At No Trace, I think about what it means to be a zero waste business everyday, and about where my raw materials are coming from, and where they will end up. I also think about how my pieces are made and the overall impact of their creation. I ask myself: what good will this product have on the planet and for the people who use it? Here are the steps I take towards zero waste. Note that I don’t claim to be perfect or to have all the anwers, but I am doing my best to be sustainable. If you have ideas or suggestions for me, please share! I am always open to improvement. I use only 100% natural, biodegradable materials in all of my production. This includes 100% cotton thread, 100% natural fiber fabric, and 100% natural and biodegradable fabric paint (which I make). 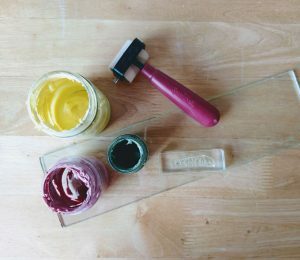 My homemade paint in jars. I use only use organic cotton or recycled cotton fabric. The production of organic cotton does not pollute our soil or water with toxic chemicals as does conventional cotton. 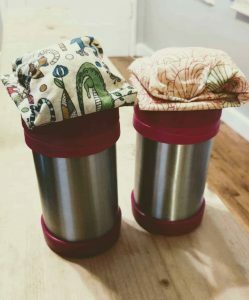 Whenever possible, I source fabrics from second-hand sources (i.e., thrift stores) and repurpose them into functional pieces for the zero waste home. My racks are made by me with untreated wood. This keeps them free of toxins and means that they can easily be composted or used in the occasional bonfire :). One of my DIY racks. No finish required. 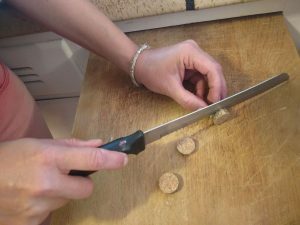 I’ve started using old corks and transforming them into buttons. Action shot! Making buttons. Don’t worry, I am very careful with the knife. Raw materials are obtained with minimal packaging. This means avoiding plastic bags or any unnecessary packaging. I buy my beeswax from local bee farmers free of packaging whenever possible. I buy with recyclable packaging when I can’t get things package-free. I always consider the type of packaging before purchasing, and make purchasing decisions based on the packaging. Tools and equipment are obtained second-hand whenever possible. 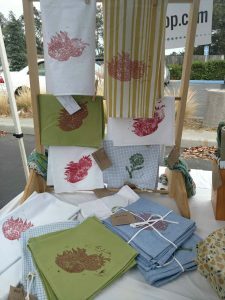 Most of the equipment used in making my beeswax wraps, for example, is from second hand stores. Used tools and equipment are my first choice for all required No Trace equipment. No waste is made in the creation of No Trace pieces. Every scrap bit of thread and fabric is saved and repurposed into something else. For example, I’ve made paper from thread bits and cell phone cases from fabric bits. I’ve made twine and drawstring ties from long thin pieces of fabric scraps, including the selvage edge. Every bit of paper is saved and turned into handmade paper. I incorporate bits and strands of thread into this paper. 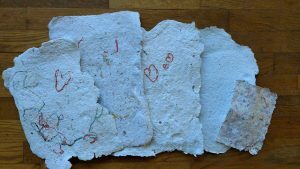 Handmade paper from Farm Day at Terra Prana farm. Patterns are designed with a minimizing of scraps in mind. Right now, after about a year of production, I have less than one jar of waste from No Trace. It is almost all stickers. I’ve considered trying to turn them into a collage…I’m not sure how appealing this collage would be, though. For now they are snug in my jar under my. Weaving scraps into a potholder. No Trace packaging is eco-friendly. 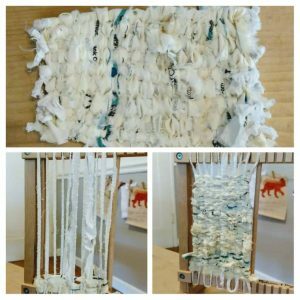 I use recycled paper and paper twine to package my pieces. Both of these can be composted or recycled. I recently learned that it’s better to compost small pieces of paper that otherwise get lost in the recycling process. My recommendation is to compost the twine and paper unless your recycling plant has a specific paper pick up that minimizes loss. I use recycled mailing materials whenever possible, and print directly onto my envelopes when possible. I have had to print mailing labels on a few occasions, which results in these small squares of waxed paper. These have several uses, apparentely, so I’m saving them for a TBD project or to pass on to another artist. Contact me if you have any interest. No Trace pieces are designed to stay out of the landfill. Don’t throw it out! No Trace pieces are designed to last a very long time. 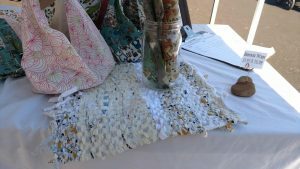 When the fabric starts to wear out after a number of years, it can be repurposed into a cleaning rag and eventually composted, or, in the case of beeswax wraps, re-waxed after a year or more. I am always here and available for any end-of-life needs around your No Trace products – just ask! Think of me as hospice for your pieces 🙂 . Depending on the supply of aged No Trace products, I’d love to incorporate these scraps into new designs where possible. A larger weaving from scraps. No Trace is solar powered! No Trace is still based out of my home, but my home is solar powered! Well, to be technical, my family pays extra to the electric company so that we can subsidize solar and other green sources of energy to the grid, in an amount that offsets the electricity that we use each month. Does that make sense? I didn’t think so. It doesn’t to me, either. But there you have it. No Trace uses green energy. No Trace is bicycle powered! Okay, this is a stretch for me, but whenever possible I DO make local deliveries by bike, especially to the shops in the Capitola area that carry my goods. No Trace is Prius powered! That’s more like it. I roll-up to the farmer’s market in the Prius. Yes, it all fits. I can even squeeze two kids and a grown up in the car with me. BOOM. There is always room for improvement in growing a zero waste business. I’m hoping to find more sources of package free raw materials. I’d love to extend my bicycle deliveries around town. And I know there are steps towards sustainability that aren’t even on my radar. But the efforts I’m making so far feel like a strong start. Sign up for the No Trace Email List for Giveaways and Coupons! What is zero waste? Your questions answered! Rock on Top 10 eco-friendly products for greener living – all under $25! 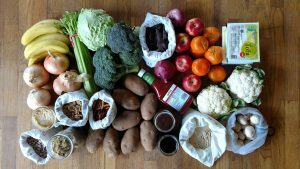 Want our awesome zero waste grocery shopping cheat sheet? Join our mailing list! Sign up for the No Trace email list!